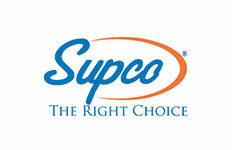 We sell 6966 items made by SUPCO. UNIVERSAL WHITE COMPRESSION DOOR GASKET 100 FT. ROLL These compression gaskets are made from refrigeration grade 100% virgin vinyl and is FDA acceptable. Gaskets style 1051 are excellent for curves with a 6 inch or larger radius. These gaskets can be notched for tighter curves or corners. UNIVERSAL WHITE COMPRESSION DOOR GASKET 14 FT. ROLL These compression gaskets are made from refrigeration grade 100% virgin vinyl and is FDA acceptable. Gaskets style 1051 are excellent for curves with a 6 inch or larger radius. These gaskets can be notched for tighter curves or corners. UNIVERSAL WHITE COMPRESSION DOOR GASKET 50 FT. ROLL These compression gaskets are made from refrigeration grade 100% virgin vinyl and is FDA acceptable. Gaskets style 1051 are excellent for curves with a 6 inch or larger radius. These gaskets can be notched for tighter curves or corners. UNIVERSAL WHITE COMPRESSION DOOR GASKET 100 FT. ROLL These compression gaskets are made from refrigeration grade 100% virgin vinyl and is FDA acceptable. Gaskets style 1160 are excellent for curves with a 6 inch or larger radius. These gaskets can be notched for tighter curves or corners. Clear Candelabra BULB 10 W 130V SCREW, Replaces 22002263, 60954 GEMLINE LT004, ROBERTSHAW 87-004. Used commonly in washers and dryers. Clear Bayonet DC BULB 10 Watt 130 volt SCREW, Replaces GEMLINE LT005, ROBERTSHAW 87-005. Used commonly in washers and dryers.